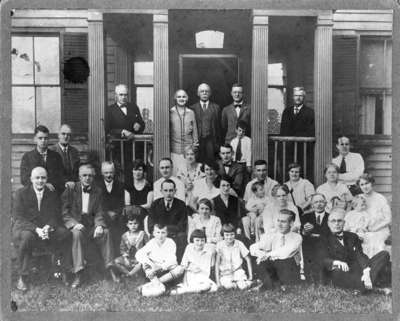 Black and white negative of a photograph showing the descendents of the Jabez Lynde family gathered at the old homestead for a family reunion in August 1926. The old homestead was located at 960 Dundas Street West, Whitby, Ontario. Standing on veranda: Sylvester B. Lynde, Mrs. Parker, Dr. W.H. Ballard, George Ballard, Frederick William Lyonde Jr., J.T. Lynde. Standing at left end of veranda: C. Lynde, R.J. Lynde. At right of veranda: R.B. Lyonde. Row seated on chairs: A. Lynde, J.J. Lynde, Warner Lynde, Mrs. Bundy, Sylvester Lynde, Carrie Lynde, Mrs. Fanning, L.L. Lyonde, Keith Lynde, Mrs. Spencer, Mrs. Axie, Louise Lynde. Next row: J.C. Lyonde, Miss Evans, Mrs. Trull, Jack Lynde, Ida Lynde, Fred Lynde, baby Bundy. Front row: Bundy and Trull children, J.D. Lyonde, Frederick William Lyonde. The Jabez Lynde family home was located at the north-west corner of Dundas Street West and MQuay Blvd. A commemorative stone was unveiled by the Whitby Mayor John W. Bateman. George S. Henry, Ontario Minister of Public Works, was also present. Sylvester B. Lynde was the chairman for the reunion.